An everyday blend of essential amino acids, our easy-to-take BCAA powder is a great addition to your fitness routine. With a 2:1:1 ratio of leucine, isoleucine, and valine — our BCAA blend provides the optimal ratio of essential amino acids to help you achieve your goals. 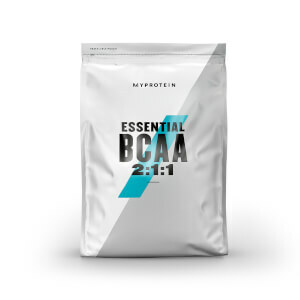 BCAA supplements are great for your fitness routine as BCAAs occur naturally in protein, which helps to build important muscle.1 These essential amino acids can’t be produced by your body so they must come from your diet — making this formula super-convenient as you can simply add it to a shake with no meal prep required. As well as coming in Unflavoured, which is ideal for adding to your daily whey shake, we’ve got a range of refreshingly fruity flavours, such as Berry Burst, Tropical, and Peach Mango — perfect for a thirst-quenching boost during your workout. Our BCAA powder is great for anyone looking to get branched-chain amino acids in a quick and convenient way. Whether you’re trying to gain muscle, tone-up, or lose weight, it’s easy to make this BCAA supplement part of your daily routine. What is the best BCAA supplement? We offer a range of different BCAA supplements to help you on your get-fit mission, and we’re here to help you find the one that’s right for you. 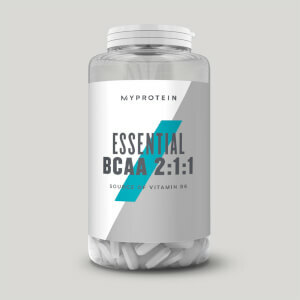 As well as this powder, we’ve also got Essential BCAA 2:1:1 in tablet form, perfect for keeping in your gym bag. Or you could try our BCAA Drink which is packed with amino acids, B vitamins, and caffeine to give you a helpful pick-me-up,2 anytime of the day. Plant-based? We also have a Vegan BCAA Amino Acid so that you can get your fill of these important amino acids, whatever your lifestyle. We recommend adding 2 scoops (5g) to 250-350ml of water or juice in a shaker before, during or after exercise — so make sure you’re prepped for your next gym session. I am 30 years old, 12 years lifting experience and 10 years as a PT. I have cut around 5x never with this supplement. Previously I have noticed some muscle and strength loss which I thought was inevitable. This time I thought I would try using branched chain amino acids to prevent catabolism of my muscle tissue which studies have claimed it does. I started with about 15g a day, one upon waking, one pre workout and one during workout. Over the next few weeks this did seem to slow or completely prevent muscle breakdown in a calorie deficit. I read more and more studies suggesting that more BCAAs would enhance the muscle preservation and strength so increased my doseage to 40mg for the last few weeks. Well... Some things happened I did not expect. I have more muscle fullness, INCREASED strength and think that I may have actually gained a slight amount of muscle! It also seems to have accelerated my fat loss and my recovery has been immense considering I am a natural trainer, train 6 days a week, in a calorie deficit with about 6.5 hours sleep a night. I have tried fat burners, test boosters, pre workouts blah blah etc etc but this is now my favorite supplement. A must if you are dieting IMO and want to maintain hard earned muscle. Theis is a warning. Always go for a flavoured version and mix it with water. The unflavoured is horrific. It's like chewing fistfuls of aspirin. If you add it to a flavoured shake it removes all the original flavour and makes the whole thing really bitter and gag-inducing. Effectiveness - I've used BCAA's from myprotein in the past and am very happy with the results I get from them. I always put in 110% effort on every workout and as a result have formed an intimate relationship with DOMS. Taking BCAAs lessens the duration and intensity of DOMS by a fair amount, making me able to hit that area again sooner - I train everything twice a week. I can't comment on muscle retention during cutting as I haven't had the need to cut yet. Eat right and you can just keep building lean muscle year round. Flavour - Previously I had some tropical flavour, this time I thought I'd live on the edge a little and ordered Blue Raspberry. Don't get me wrong, its perfectly palatable (if a bit too sweet and not at all raspberry flavoured), I just didn't expect it to be so...blue. I feel like I'm drinking a magic potion from World of Warcraft, and a couple of regulars have very helpfully pointed out that ink is for writing with, not drinking. It does go nicely with the lid of my MP shaker though. There's always a silver lining. Water, MP blue branding, smurfs. Really enjoying my experiments with BCAA's - seems to be providing exactly the boost I needed for quicker recovery and preservation of muscle mass whilst dropping calories. As a girl I'm not looking to get super swole, just to tone up, lean up and bump up my muscle size without getting bulky. This product has definitely helped me to train harder and longer. I'm seeing really impressive results and increased capacity on heavy weights and reps with a significant reduction in BF% and better definition. I have watermelon flavour which is good but pretty sweet. Mixes relatively easily but needs a lot of shaking. This BCAA product is effective, the flavoured version is always much more palatble and easier to mix than unflavoured. However I just purchased watermelon flavour and it is so sickly sweet I would never buy that flavour again. I previously had 'berry blast' flavour and I would definitely recommend that one. I don't understand why My Protein uses all these hideous additives and colourings to make the drink a synthetic 'watermelon' colour. I would much prefer to have a product with the least amount of additives possible especially one for a BCAA - I don't choose to drink it based on how appealing the colour of my drink is. I always lose muscle with running or cardio but since I have taken this supplement it has solved this issue. I've noticed that I keep my muscle after long runs and my body fat has dropped. It works really well with intermittent fasting and lean diets. I brought some unflavoured BCAA's in the hope of throwing it into my shake after a workout instead of having to have an extra drink. Because I was going to have it with my shake I got the 'Unflavoured' one so that I wouldn't be able to taste it in my shake. Unfortunately I was wrong. I put two scoops of the BCAA's into my shake and mixed it together and it completely changed the taste of my shake and I wasn't able to drink it because I couldn't stand the taste. It was also very bitty and didn't mix great. However, my friend has just brought the Tropical flavour and said it tastes amazing! So I thought I would just write a quick review to let others know that Unflavoured isn't too great in my opinion. I am going to buy another flavour and just have a different drink while working out. I ordered the MyProtein BCAA pouch Unflavoured of 500g one month ago. Overall, due to it’s flaws, I wasn’t 100% satisfied. However there is advantages to this supplement therefore I believe it overpowers the flaws thus making it worth using. I bought the unflavoured BCAA as it has no additives or artificial sweeteners including Sucralose which is included in all the flavours. I believe Sucralose can have bad effects on the body over time therefore I used the unflavoured one. To start, the flavour is absolutely gut-wrenching. I found it was a sour, chemically taste. I first tried it with 20g of Impact Whey Protein mixed in Semi-Skimmed milk. However I couldn’t continue the mix as the taste was too bad. I changed the mix to 20g Whey with 10g BCAA mixed with strawberries, bananas, goji berries and milk. This taste was beautiful. The natural fruit sugars completely masked the chemical taste and overall made a great smoothie. I recommend using that mix if you have the unflavoured BCAA. The texture is a very light almost icing sugar-like powder. I would say I will get about 6 months out of 500g, therefore it is a great price for the amount. I have seen results with the product, yet not outstanding. However I do believe my muscle cells have repaired after training more efficiently while using the supplement as I rarely am supremely stiff in the morning. As far as body image I have only seen a small improvement. To conclude I recommend using this product if you work out or play sport nearly every day, to help rebuild your muscles in the short time you have to recover between sessions. I believe it is worth the price and could help you achieve your sporting goals. Banana, Strawberries (x4), 20g Goji Berries, 200ml Semi Skinmed Milk and 20g Impact Whey all blended in a smoothie. I purchased this flavour a couple months ago, and was so happy with the taste I loved it. If I had written a review then it would have been 5 stars, however the second batch tastes like the formula has changed. Now Peach & Mango tastes cheap/ flat and has a soapy taste to it. I am really surprised by this as it used to taste so nice. I will be going elsewhere for my BCAA's in future as it seems all other flavours have a soapy taste to them now according to other reviews. Why change something that was already very good. Great product - unsure about the new flavours! I have had this in 'berry blast' flavour, which is quite nice. I then decided to re-order some in a new flavour 'cherry limeade' - don't. This is awful. The taste is hideous and it leaves a powdery effect in your mouth. Learnt my lesson: stick to what you know! Also, tip of anyone with IBS, this isn't the best product for our stomachs and I've since started to take BCAAs in tablet form due to the amount of sweeteners in this and have found this has helped me a lot.